It is very necessary to have a LED maintenance light on car in case your car has trouble at night. This ultra-light handheld lamp, which has a magnet on the back and a folded hook on top, providing multiple usage methods, is you best choice! LED maintenance light with IP65 waterproof protection, especially designed for car repairing at night, is also can be used as emergency light, camping lantern, etc. It adopts 48pcs LED beads, and cover uses high light transmission PC material, 750LM luminous flux, ultra-bright and with great heat dissipation, anti-glare and anti-drop. It only costs 6W, can easily substitute other 15W lights. Built-in 2 * 2000mAh lithium batteries, high capacity provides ultra long service time. 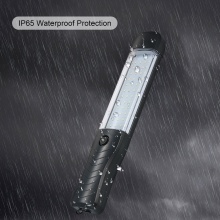 With over-discharge & overcharge protection function. Handheld design, anti-slip handle for safer and convenient operation. It has a magnet on the back and a folded hook on top, can be absorbed on metal surfaces(such as your car) or hung up to free your hands. Made of Aluminum plate, ABS shell and PC cover, it weighs 11oz, you can place it in car to respond to emergencies or carry it around for many outdoor activities.